This hour and a half monologue/play highlights some of the injustices which occurred during the G20 summit during the summer of 2010. Tommy Taylor is the writer and performer of this amazing tale, who shows up centre stage in old over sized long sleep T-shirt and raggedy jeans. He looks like a sweet down to earth overgrown high school teenager who is a typical W.A.S.P. Canadian. He goes on to tell the story of the amazing sense of community he felt when 20,000 protesters gathered from all sectors of society ranging from grandmothers to bikers coming out in force peacefully protesting in a park. This quickly turned into a nightmare weekend imprisonment with no food, no water, a porta-potty without doors, and squeezed in so tightly with others he passed out from dehydration. During this entire time in custody, prisoners had their hands zip-tied together. Tommy eloquently shares the journey of how it feels to have your rights stripped away from you, without any evidence of wrongdoing. The emotional and psychological up and down of being beaten, handcuffed, dragged, mug shots, transported by bus, and locked up where you lose the track of time due to the unflinching lights above you beaming down 24/7. He shares details of the war like attitude of the cops that came from around the country. He pointed out many from Calgary and Edmonton police departments showed up in full riot gear looking for a reason to use their “toys”. They would then verbally assault anyone who was LBGT, and conduct strip searches on women. What enraged Tommy was that during the day of capture, he saw about 50-80 young vigilantes vandalizing shop windows and setting police cars on fire. The police allowed this to happen, and the encouraged the media to eat up each delicious storied morsel. It was 6 hours later around 8 pm that Tommy and 100 other peaceful protesters were corralled on all four sides. They, along with 1100 other people arrested, were detained like guilty criminals. A couple who went to dinner at the Keg Steakhouse, just happen to exit onto a police barricade that Tommy ended up in, and was thrown into prison like the rest of them. This ordeal was terrifying to hear, as you learn about being separated from your loved one. Unable to see your friends, and even after all is done, all your possessions were taken away, so having no resources to even get home. At the end Tommy was not charged with any criminal act and was let go. No one investigated or interrogated him, he simply had his picture taken and all of his possessions taken away and thrown into a cage with 40-50 other men. Originally during construction, the cells were meant to hold no more than 20. The temporary facility on Eastern Avenue, set up in a former film studio in the city's east end, had a maximum capacity for 500 prisoners. Police estimated about 1,000 people were detained there at various times between June 24 and 28 during the G20 protests. The police had contracted out construction of the temporary prison 4 months ahead of time. All the tactics used on the prisoners were classic textbook methods to keep them docile. With the extreme light and tight quarters, they lost sense of self-identity and sense of time. It was designed to break their will. At the Britannia Shipyards in Richmond, along the Fraser River of a breezy summer evening, a full cast of 13 actors gathered together with live musicians. Brought together to tell a story about the fishing towns tension between different ethnic groups. The tension comes from the decline of fish stocks, and of big fishing companies taking over. There were many stories overlapping each other. Racial tension arises between the local Caucasian fisherman, and the highly efficient and skilled Japanese fisherman fighting over the days catch. 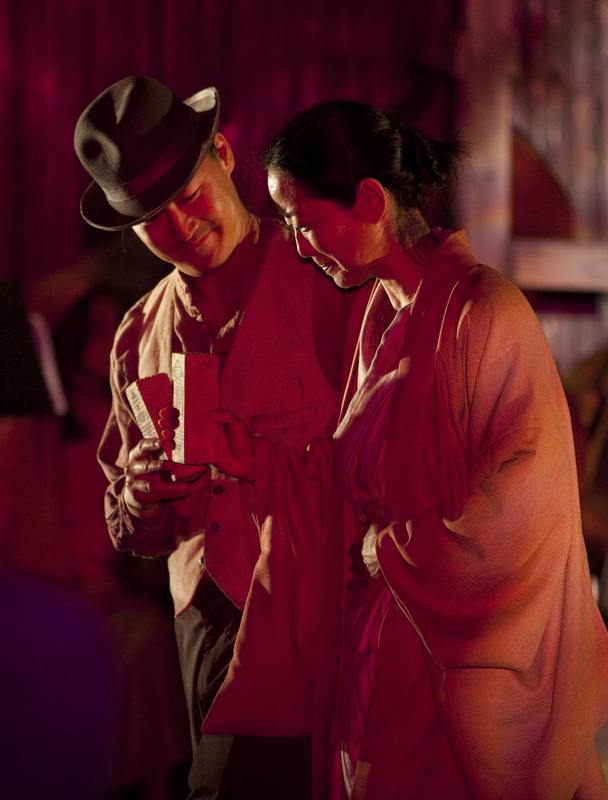 The disapproval of the Chinese migrant worker’s romantic pursuit of a Canadian Caucasian girl upsets the locals. And finally the tension between fishermen catching their own fish, to getting a job in the fish factory for canning. The whole play had so many colourful characters. From the showboating of the Chinese migrant worker, to the black owner of a small fishery sharing history lessons about his fight to stay in the game. All despite all the up and downs over the years. The play was performed over three venues. It began on the grassy lawn of the park after a First Nations representative blessed it with a song and dance from the Coastal Wolf Pack Dancers. 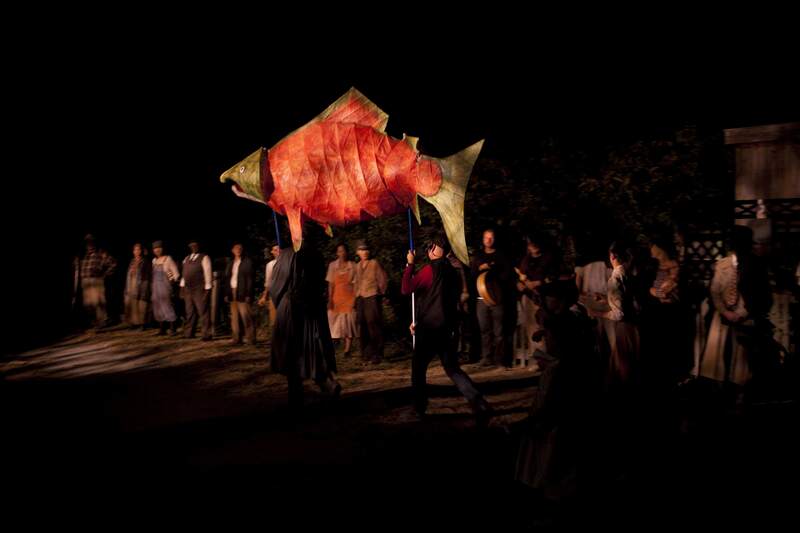 There were children and youth, each with paper mache fish running through during a ceremony scene. We then moved to the second venue which was against a closed fishery. This served as the cannery, local shop, fisherman's house, and the dock where fishermen went to work. The last venue was next to a small vegetable garden along a farm house, where projected images onto the farm siding was used during a dream scene. 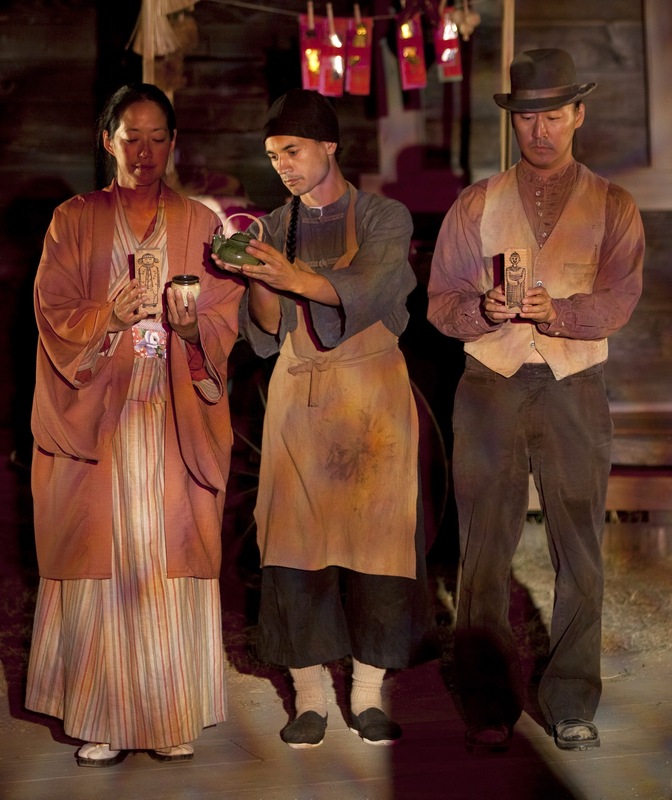 This play displayed the rich conflict and culture of Steveston’s fishing industry. 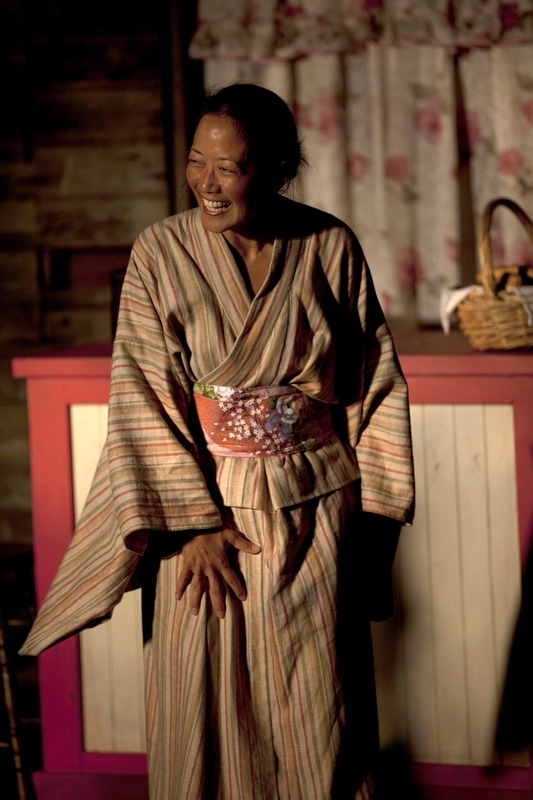 The stories of its people, woven through song, costumes, prop and amazing acting. The giant robotic cannery transformer kung fu fight mid show was so existential and cool, a total surprise element that thrilled the younger audience. I spoke with Mortal Coil’s general manager Marietta Kozak, a vivacious lady. It was inspiring to hear her tale about how it took years to turn this play into reality. She was so excited to be able to tell stories of local history and hope other theatre will follow suit. Salmon Row was written by Nicola Harwood, directed by Peter Hall and Martin Kinch, music composed by Tobin Stokes. Contained in the history of Cannery Row on the Fraser River is the history of British Columbia. The stories of this place is so complex, rich and filled with conflict that reducing them to an evening’s entertainment is almost impossible. We have chosen to focus on Cannery Row rather than tell the story of the town of Steveston, although the two stories are, of course, inextricably linked. We have combined truth with fiction to serve the story and of course there are stories that got left on the cutting room floor. Far too many. My sincere wish is that all of us who call this province home begin to understand the controversial history upon which our present rests, we will be inspired to rescue what is left of our natural resources, rehabilitate our relationship to our first peoples and welcome all immigrants who make this place home. We welcome you in. You are part of this story. This production was made possible with the support of The City of Richmond, The Province of British Columbia and Fencer Fence Rentals. Mortal Coil is a performance company dedicated to creating imaginative theatre and spectacle for all audiences. Through the use of stilts, masks, puppets and costuming, the company creates performances in theatres, at festivals and at site-specific events locally, nationally and internationally. The company also empowers communities to celebrate their creativity through classes and workshops for professional performers, educators and general public, and by creating performance opportunities in which the local community can participate. 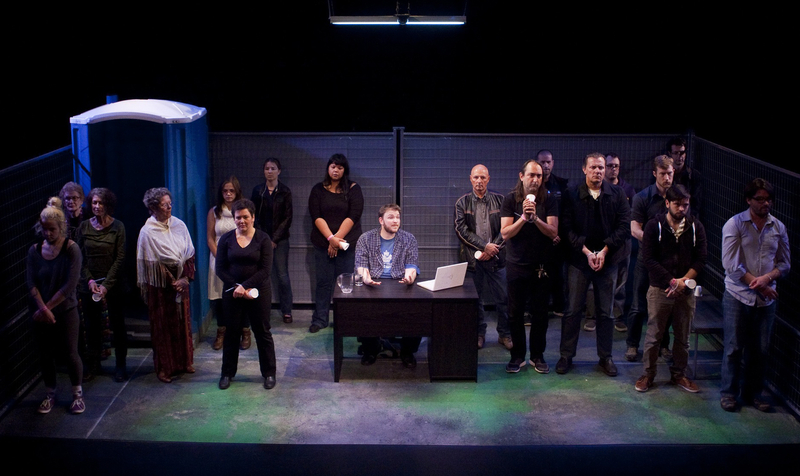 Salmon Row was developed and workshopped with grants from Arts Partners in Creative Development and the Canada Council for the Arts, and was originally produced at the Britannia Shipyards National Historic Site in August of 2011.